Greene grew up near Amarillo, Texas and attended college at the New Mexico Military Institute where he was on the varsity football team for three years. As soon as he was eligible, he applied for and was accepted as an aviation cadet with the U.S. Army Air Corps. Paul was awarded his wings at Randolph Field, class 40-C with fellow AVG’er, R.T. Smith. The following year, as a flight instructor at Randolph, he and R.T. convinced the AVG recruiter, Skip Adair, they should be hired for the First American Volunteer Group being formed to defend the Burma Road for China. Although, neither had flown the P-40, their persistence prevailed and P.J. set sail for China with R.T.
P.J. participated in the first combat of the 3rd Squadron defending Rangoon, Burma on December 23, 1942. During the air battle, he was jumped by several Japanese fighters and was forced to bail out. The Jap pilots made several passes trying to strafe P.J. in his parachute, but he evaded their bullets by making his parachute swing out of the line of fire. Eventually, P.J. simply played dead and his attackers left him to land in a rice paddy. The following April, P.J., together with R.T., attacked seven zeros. They each shot down one enemy fighter but the combat had cost them their gas. Seeing R.T. crash land in a dry rice paddy, P.J. was forced to land in a tiny field on a mountainside. With refueling, he was able to save the much needed fighter. 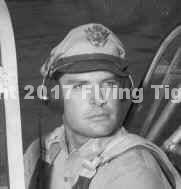 After Paul Greene was honorably discharged from the Flying Tigers, he returned to the States and reentered the Army Air Corps with his commission as a 2nd Lt. but quickly advanced to the rank of Major. P.J. was then assigned to the Army’s Air Training Command along the Texas gulf coast for bombing and gunnery schools. In two years, Lt. Colonel Greene was sent to Italy with the 15th Air Force to command the 97th Fighter Squadron of the 82nd Group flying the Lockheed P-38s. Upon returning to the U.S. a second time, Greene was assigned to the Pentagon Fighter Branch which was his last military assignment. Following the war, Greene became successful in several businesses. He began with a marine/salvage operation in Long Beach, CA. One purchase he made was two new surplus P-38s, fully equipped and fueled for $1,250 each! Greene entered the water well business by developing the pumping system which doubled the output of water wells making farmers independent of electric power outages occurring at the time. A short business as a cotton farmer in Arizona gave way to a very successful textile business for many years. Paul Greene has remained active in aviation as a pilot/owner/builder of several general aviation and sport aircraft.